I have to say, it doesn’t feel good to lose, but I can take it like a big girl. Last year GA Tech beat Georgia. And I celebrated. It felt good! Over on that huge social media site that rhymes with “spacelook” though, my friends, who happen to wear red, were not happy at all. Kinda ugly actually. This year Georgia beat us. It’s all in fun though; that’s why it’s called Clean, Old-Fashioned Hate. Well, that doesn’t sound too fun. But it is what it is. I have to admit, I enjoy being the underdog. Or the underJacket, I should say. Even though we have had a much better season (than they) and are heading to a conference championship (and they aren’t), we will always be the underdogs in this rivalry. It makes it that much more of a joy to win. And the sorrow over loss, while still sad, doesn’t leave me whining about it for days. There’s always next year! I am so happy we have CPJ (Coach Paul Johnson), even though I don’t think I’ll ever understand how he had enough balls to try what he did during the last plays of the game. He’s. not. a. sissy. He’s goes for it on the 4th. And I like a team that’s going to go for it. So, even though his strategy didn’t work this time I’m going to trust him to lead Josh Nesbitt and Jonathan Dwyer and the rest of the team next year. We rock. GO JACKETS! On to the ACC Championship game! There’s nothing like a Yellow Jacket girl! BTW: Yellow jackets are so much more fierce than overweight, inbred dogs, don’t you agree? One of the two cannot be outrun. Har har. 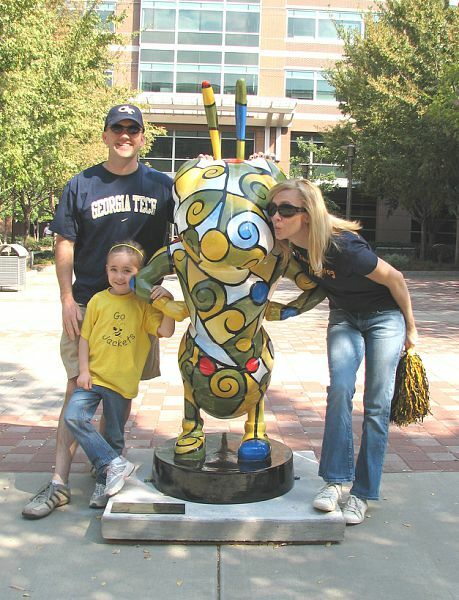 Go Jackets, Fight! That’s my Yellow Jacket girl! UGA won. I’m not going to whine like UGA does every game that they lose – I know, maybe I should blame the referee, or poor sportsmanship (like umm, intentionally going after a star quarterback); either way, in the end, GT allowed UGA to run up the middle too much and had a few offensive mental mistakes which ended up leading to a narrow defeat. Although GT is clearly the better overall team this year, they had a bad game and paid for it. Congrats to UGA.